I've had a great weekend here in Texas. Love visiting the small town Waxahachie - not only for teaching, but for antiques, good food and friends. Carolyn has moved her shop a couple blocks over, facing the beautiful historic courthouse. This was the view when we came out of her shop after the first class. What a view! Friday was the Homecoming football game for the local high school. So what does that mean in small town USA? A parade of course! We took a break from setting up for class to walk to the corner (all of about a 100ft) to watch part of the Homecoming parade - complete with a huge marching band, floats, the homecoming court. Just a quick thank you to all the ladies that came to the classes...so many familiar faces! We had a great time learning a lot of techniques from creating faux snow, to working with Alcohol Ink and learning how to work with the Collection Folios. Here is the Winter Wish group - Prissy, Beth, Monica, Fairlyn, Regina, Stacy, Marilyn, Terry, Cindy, Ludi, Amy, Lisa, Rhonda, Betty, Tove, Alice, Mary, Kay, Paula D...and me, Paula. Hey, not too bad remembering all the names! Although, I am sorry I didn't get pictures of the other two classes! The Crafty Scrapper is a great local store, something we all need to support. I am sure hope if you are even close to the area, you stop by to shop or take a class. The new store is over 4,000 square feet...and what's not to like about that? I am using the 8 x 8" Seasonal - Collage Mini Stash for this project. This Seasonal Paper Stash includes Valentines, Easter, 4th of July, Thanksgiving and Christmas papers. Each holiday section has images and even letters that are easy to cut out for projects. I used a Collage Glue Stick to adhere one of the papers to a piece of thin chipboard. Cut off any excess chipboard. 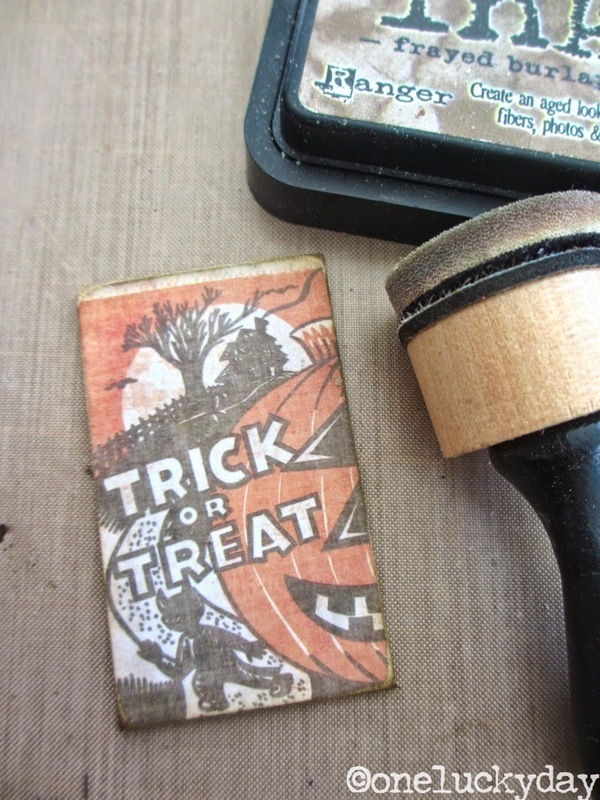 Yes, I use a roller cutter for cutting my chipboard! Then cut up all the individual pictures (I got 15 cards from the sheet). I sanded the edges with the sanding grip. Then inked with Frayed Burlap Distress Ink. I wanted to add some eyelets to the top but I only had silver. Pitch Black Alcohol Ink will solve the problem. Just squish a little Alcohol into the bag and squish it around to coat. Dump the eyelets out onto the Craft Mat to dry for a minute before using. Use a CropaDile to add the eyelets to the top of each tag. I added Paper String to the top of each card. Then tied each to a bag of Halloween candy. Again, a super easy way to use the paper for a quick party favor. I will see you back here on Thursday for another Halloween project using this same paper stash. You won't want to miss it - it's a Halloween favorite! Ooo how awesome! I love your goodie bags! TFS Paula! Looks like you had a great time in TX! I wish there was a store like this in my neck of the woods. 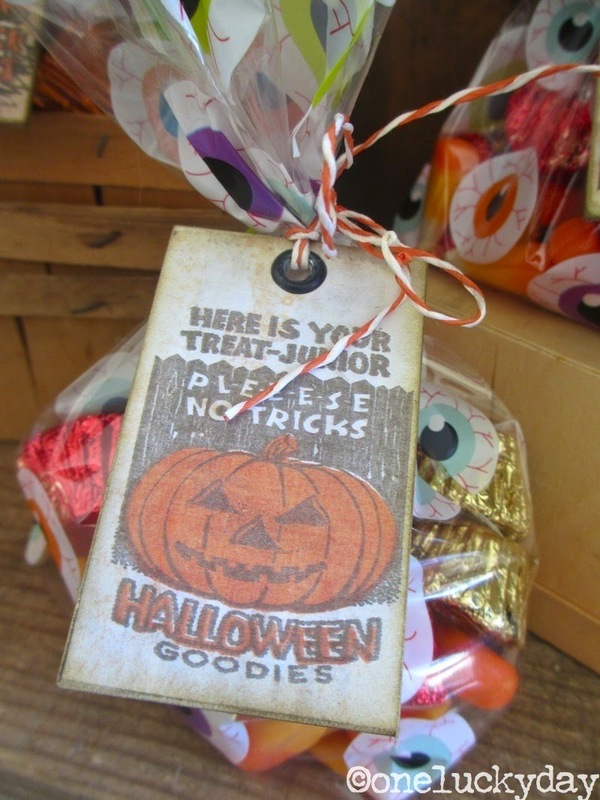 Great idea for Halloween tags Paula! Love the eyeball bags! Glad you had a great time! I was at Benbrook's Heritagefest with my craft table on Saturday and all I could think about was wishing I was in Waxahachie with you guys instead-lol! Next time for sure!! Awww! 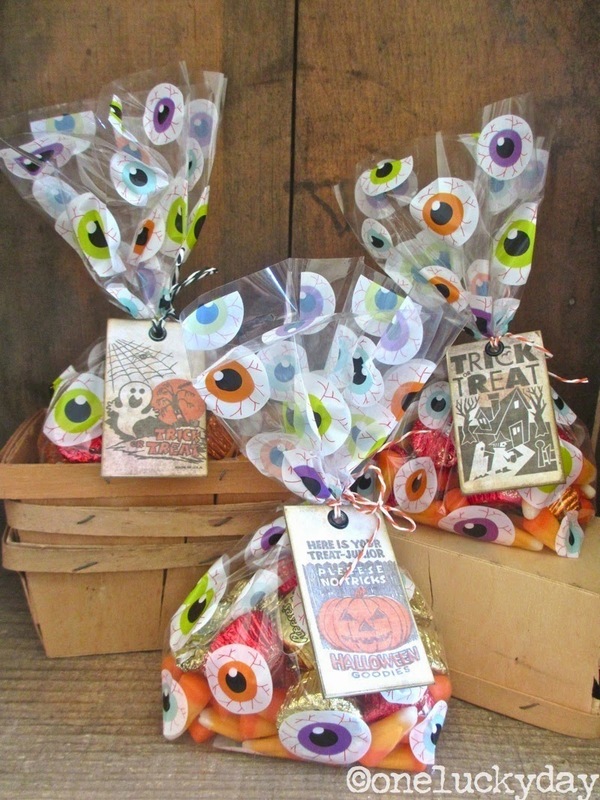 How cute are those treat bags?! Love your technical term of "squish the alcohol ink around!" Gotta love old architecture! Love the tags too. Laura, I mailed your fabric today!! So cute and so easy! Great tip about coloring the eyelets! These are just too cute!! Thanks for sharing. Paula, I so enjoyed your class this past Saturday. Everyone I have shown my Christmas scene to loves it!! 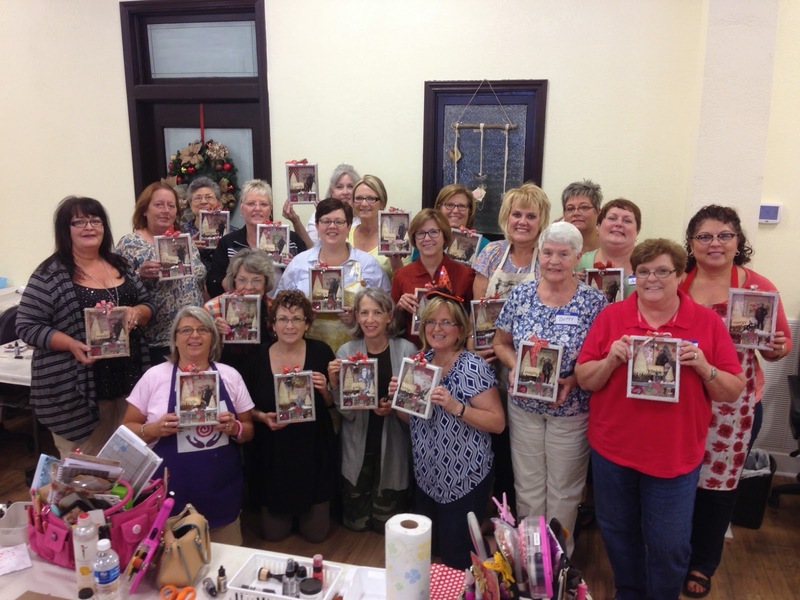 It was a lot of fun meeting you in person at the Crafty Scrapper! Glad you enjoyed your time in Texas! These are so cute! I am going to make them for the special neighbors who come every Halloween to show us their costumes. Also, they will be fun for a family birthday get-together this weekend. Hope I can pull it together fast! Thanks Paula. I'm glad you enjoyed Waxahachie - it's one of my favorite places in TX! The Crafty Scrapper is my favorite scrapbook store! Sorry I missed your class when you were here... next time!